So, last week I was in Target for the third time (that week...yeah), shopping for tissues and laundry detergent. I left with three bags filled with various items I didn't need and a healthy dose of guilt. My poor bank account. One of the products I most certainly didn't need was fancy new bottle of EOS Shave Cream, but I was so moved by the sight of it that I squealed - loudly - and was then forced to add it to my shopping cart by the slightly freaked out stares of my fellow shoppers. I just HAD to buy it after flipping out for it, you see. The total strangers sharing the aisle with me that morning would have been so very disappointed if I didn't. Plus, it was on sale. So, yeah, that's all I needed to convince myself. FYI - don't ever take me along on a shopping trip. It will become a spree within five minutes, and nobody needs to blow their mortgage on pumps. Ms. Thoughtful - that's me. I've been a fan of EOS lip balm for a little while now, and I had been hoping to find and try their shave cream, since all but one brand of shave cream/gel that I've tried has wreaked havoc on my skin. That brand is Aveeno Positively Smooth, and I adore it, but I can't seem to get my hands on it very often. I'd recently begun using an exfoliating body wash by St. Ives, and it worked so well I was ready to give up on shave creams and gels forever. Then I spotted the EOS Shave Cream in its adorable soft-touch bottle (recyclable and no rusty tubs rings!) and I was thrilled. 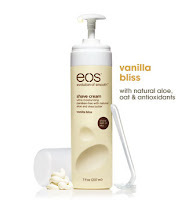 My Target only carries one of the six available EOS Shave Cream fragrances, and that's Vanilla Bliss (the others are Pomegranate Raspberry, Lavender Jasmine, Island Blue, Cucumber Melon and Sensitive/Fragrance Free). Now, I'm not normally a fan of anything that smells like vanilla, unless it's a candle or a cupcake. To this day I nauseously recall the vanilla body lotion that every girl seemed to be slathering on in between classes in high school, and which made it so difficult to concentrate. I'm choosing to blame my C in Senior Research and Study Skills on that lotion, and not on my crush on the cute boy who sat in front of me. He hated the scent too, so much that he told me about it and I decided to remember that little tidbit for the next fifteen years, just so I could share it with you. Whaaaat? Anyway, the vanilla scent of the shave cream isn't overpowering, thank goodness, and quickly dissipates in the shower, which is where I first tried this product. EOS claims that their shave cream is "so moisturizing, you can shave wet or dry, leaving skin soft and smooth," so I was eager to try it both in and out of the tub. The first time I used it I quickly realized that it would work best if I kept my legs out of the water while I was shaving. It's more like a lotion than a traditional shave cream, and I used three to four pumps on each leg, leaving a thin layer of the product on my skin. If any water from the shower reached my legs, the cream rinsed off immediately, so I used the old foot against the shower wall shaving technique, and away I went. I was pleased with the protection the cream provided, both on my legs and under my arms, however, since it rinses off so easily I encountered areas where the cream had disappeared, and that was not so pleasant. The EOS shave cream is fortified with natural aloe, oat and shea butter, and it does moisturize nicely if you can keep it on your legs long enough to make contact with your razor. I also noticed that, while the cream rinsed a little too easily from my skin, it did not rinse so easily from my razor. In fact, it gunked it up but good and I had to take several breaks to clean my razor well enough to continue shaving. After my shower I felt my legs and I was completely satisfied with just how close a shave the cream provided. It may have been the smoothest my legs have ever felt, and I was convinced the results were worth the trouble I experienced in the shower. Two days later I decided to give the EOS Shave Cream a whirl on dry legs. I propped my leg up on my bathroom vanity, dispensed a few pumps and buttered my leg up with the cream, and began. Dios Mio, DO NOT TRY THIS. I was only able to get through shaving my lower right leg before the discomfort was too much to bear. IT HURT. IT BURNED. I cussed and whined a little, and hopped into the shower to finish the job. Now, it's very possible I was doing it wrong, but I've been shaving my legs since I was eleven - it ain't rocket science, and I'd like to think I've gotten quite proficient at it in the years since I first started practicing with my mom's Bic. The cream provided little protection, and my dry skin underneath just wasn't prepared for the assault it received. I was disappointed, but, really, what was I thinking? Attempts at dry shaving almost never end happily. I consider it a lesson learned. 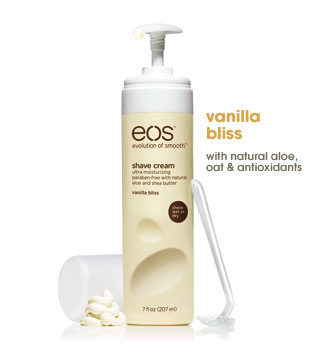 So, what do I think of the EOS Shave Cream in Vanilla Bliss? I don't love it, but I do like it - as long as I use it in the shower. It does provide a very close shave, and lovely moisturization. The scent - eh, it's not my favorite, but I would be willing to try one of the others if I could find them. So, I'm giving it 5 out of 8 Tentacles. It would have been a 4, especially because the epic dry shaving failure, but also for the low viscosity of the cream and the resulting lack of water resistance, but I really do love just how smooth it leaves my legs after shaving. IN THE SHOWER. ALWAYS, ALWAYS IN THE SHOWER. PLEASE. I find that it works dry as long as you wet you r hands and rub them over your shaving cream covered legs.